We all know that honey can be as effective in treating coughs as over-the-counter commercial cough syrup, but studies have shown that it can also improve quality of sleep as well. According to Dr. Ron Fessenden, who researched claims that honey improves sleep quality on his blog, raw honey contains “an ideal ratio of fructose to glucose,” to support the liver, an organ that works non-stop, during the sleeping process. Here’s more details on how taking one or two teaspoons of raw honey before bedtime can help you sleep better. First, it ensures an adequate supply of liver glycogen for the night fast. The average adult liver can store only about 75 to 100 grams of glycogen, with differences between men and women and according to body size. The body will consume about 10 grams of glycogen per hour (6.5 grams by the brain and 3.5 grams by the heart, kidneys, and red blood cells). When one eats dinner at 6:00 pm and goes to bed at 11:00 pm, the body will have utilized up to half of the liver’s supply of glycogen, leaving less than needed for eight hours of rest. Eating honey before bedtime re-stocks the liver with glycogen and ensures getting through the night before the brain triggers a crisis search for fuel, which would normally wake you up. Second, honey facilitates restorative sleep by contributing to the release of melatonin in the brain. Honey triggers a small spike in insulin levels, and insulin stimulates the release of tryptophan in the brain. Tryptophan is converted to serotonin, which is then converted to melatonin. Melatonin in return inhibits the release of insulin, thus further stabilizing blood sugar levels during the night. Melatonin is necessary for restorative sleep. Often called the “wellness hormone,” it helps to enhance immunity and facilitate the rebuilding of tissues during rest. – It is a natural anti-bacterial agent with significant wound-healing properties, historically used in emergency medicine for its ability to fight infection. 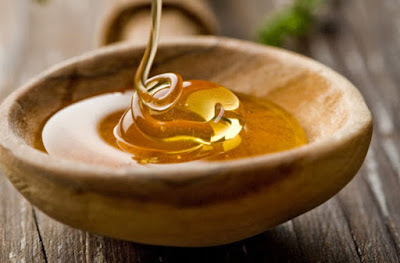 – Often used in organic shampoos and soaps, honey has been proven to effectively fight inflammatory acne. – Honey is a novel antidiabetic agent, reducing blood glucose levels and generally being more easily tolerated than other sugars. – A natural antimicrobial, honey has shown significant potential in dealing with drug-resistant bacteria, and possibly even reversing antibiotic resistance. A review of multiple studies suggests that when taken in significant amounts, honey has a whole host of health benefits – all the more reason to make it part of your daily diet, especially as a sugar substitute. Getting honey from the source can be another challenge; while honey is easy enough to find at your local supermarket, it doesn’t always come from sustainable sources, which can be a real problem with so many bee populations currently threatened byColony Collapse Disorder. To find local, sustainable sources of honey and support your local pollinator populations, try using this online honey locator tool to find apiaries that sell organic raw honey near you.